One of a pair of portraits, painted just before the marriage of Thomas Middleton-Trollope and Isabella Thorold on 14 August 1759, commissioned by Mr and Mrs Middleton-Trollope. Isabella is ‘wearing a low-cut gold-coloured dress, a blue cloak with a matching blue ribbon at her neck, a pink rose at her bosom’. 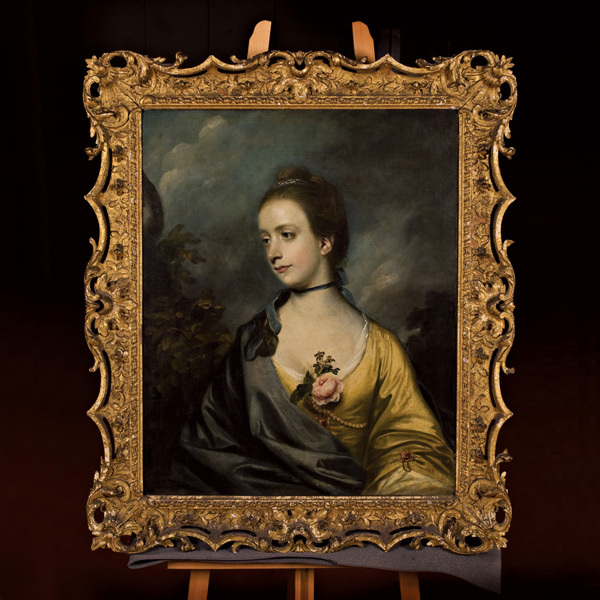 The two portraits descended separately, Isabella went to her own family, while her husband’s portrait (Thomas Middleton-Trollope) went to his family. They are, however, in identical frames. † † Mannings and Postle 2000, p448. As first president and founder member of the Royal Academy, Joshua Reynolds was one of the most celebrated artists in Europe. Reynolds was born in Devon and he travelled in Italy for three years before setting up as a portrait painter. He drew on his study of classical antiquity and Italian painting and produced portraits in the Grand Manner, filling his paintings with heroic and moral symbolism in an attempt to raise the status of the genre. With his rival Thomas Gainsborough, he was the dominant English portraitist of the second half of the 18th century. He was a socialite, a self publicist, and ‘a driving force in the emergence of eighteenth-century celebrity culture’. His portraits provided a public image of some of the most famous and fashionable men and women of the period. Reynolds was a prolific, popular painter and influential teacher and theorist, delivering his Discourses on Art to students and members of the Royal Academy between 1769 – 1790. He became Principal painter to King George III in 1784 (Andrea Martin, The Art Fund 2007/2008 Review).